Destination: Fence Lake, St. Joe’s Island, Fulton, Texas. Members and guests: Scott Fossum, John Purcell, “Bear” Auger, Matt Blyth, Josh Ritchie, Scott Breedlove, Keenan Miles, Pamela Canales, Phil Shook and Chris Sumers, Outing Leader. Photos courtesy of Phil Shook and Scott Fossum. Note: Most of what you will read here is true. The morning started oh, so early with Bear being the first one to arrive at the docks. It wasn’t long before all had arrived, exchanged pleasantries and, loaded their kayaks and gear about the Skimmer, our mother ship for the day. We had a good mixture of long time and new members as well as outdoor writer and renowned author, Phil Shook, who just a couple of days before joined the outing in hopes of getting material for an upcoming deadline. With the sun peeking over the horizon and a mixture of Jimmy Buffett and Joe Ely serenading us over the speakers, we made our way across Aransas Bay and in a few short minutes, Capt. Tommy Moore was easing back on the throttles to announce our arrival at Fence Lake. Some of the gang hit the water and the rest of us made it up to the flying bridge and the “unloading” process began. Shortly, everyone had collected their kayak, loaded their gear and paddled off into the gentle morning breeze in pursuit of redfish, speckled trout and the other inhabitants of Fence Lake. I headed toward the back end of the lake to a spot where I can fish all day and not move more than a couple of hundred yards. Unfortunately, as a got closer, I notice there was a skiff already back there so, I slipped in to a pocket that several fingers slipping back into the marsh. I set anchor and on the second cast, I had a nice blow up on my popper but, the red missed it. So, I immediately cast back to the same spot and no sooner than the fly hit the water, the water exploded and I was hooked up. The first run took me almost to the backing. It was then, that I noticed Phil Shook paddling in my general direction. I called to Phil and in short order he was on hand to chronicle my capture of a nice redfish. After a few quick snap shots from all angles, the red was released back into the Fence Lake waters to do what redfish do. After the obligatory “Hi-5’s”, Phil took off in one direction and I continued to work to my spot. About mid-afternoon, I finally made it back to my “spot” and switched from my popper to a “Macko” fly, tied for me back in February at the Dr. Ed Rizzolo Fly Tying Festival by Dr. Rey Ramirez, Jr. Back in this area, the water is about 18 inches deep and the bottom has a nice mottled effect of short grass and sand spots. 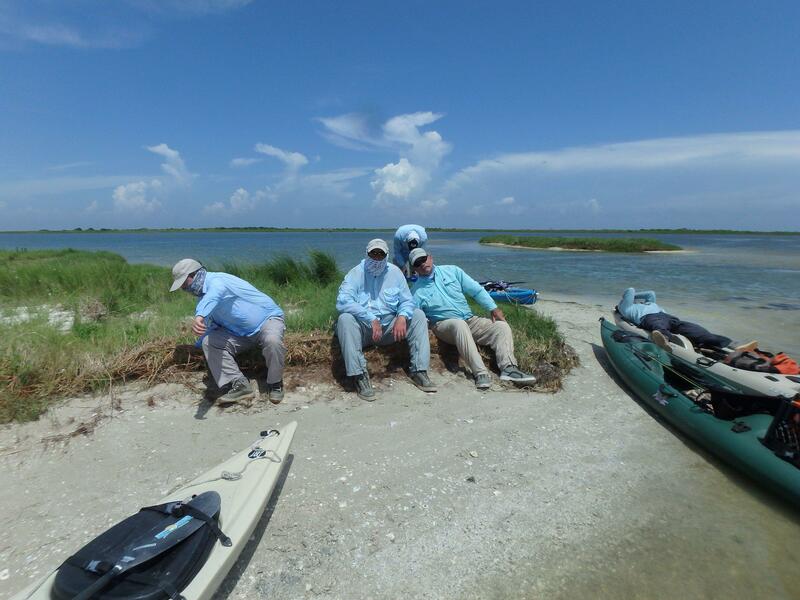 There were a few redfish leaving wakes but none coming close enough to “sight cast” to. 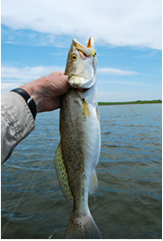 However, hidden away in one of the grassy spots was a 21 inch speckled trout which slammed “Macko” and proceeded to put up a great fight and slipping the drag several times. Once the leader was in hand, I began to notice the most impressive feature on this fish, her markings. She had a dark back covered with sharp black spots and a bright yellow mouth. Her big belly told me she had just downed one of the many mullet swimming around the lake that day or, she was ready to lay seed to another crop of baby specks. To that end, I left her in the water, gently removed the hook and let her swim off, none the worse for wear. The rest of the afternoon was relatively uneventful with the exception of a nice thundershower that popped up in the near Gulf and caused everyone to take notice for an hour or so. But, it finally broke up and left us alone, allowing us to finish the afternoon fishing in peace. About 3:00 we all gathered at the usual rally point to swap stories and wait for the Skimmer to scoop us back up. Of the day’s notable catches were speckled trout of 20 inches by Josh Ritchie and, an 18 incher by Phil Shook, which, hear told, was headed to the skillet (see photo). The Skimmer showed up to retrieve us in true “Skimmer style”, more Joe Ely coming out of the speakers and a cold drink waiting for us. It didn’t take long to reverse the loading process and, along with our gear, we were soon all back aboard the Skimmer as Capt. Tommy pushed the throttles forward and headed her to the barn where, in short order, everyone had their kayaks strapped down, their gear safely stowed and their faces in front of the air conditioning vents in their vehicles. After every one had a chance to cool off, freshen up a bit and enjoy a cold beverage, Pam and Phil Stranahan (aka Texas Flyfishers Rockport division) hosted the club for a fine BBQ dinner following the outing at their house. Food and drink were plentiful and everyone was full. Stories were plentiful, but probably not truthful as we enjoyed. Eyelids descended along with the sun with all departing the living after a tiring day of kayaking. I want to thank all the members who made the trip to Fulton and once again made this one of the best attended saltwater outings we have each year. I hope to see you back here in 2016.